Nervous about going to the dentist? Archer Dental understands. We offer laughing gas during dental visits so you can always have a relaxing experience with us. Whether you haven’t been to the dentist in decades, or you’re right on schedule but can’t help feeling apprehensive, one of our caring dentists will make sure you receive only the best care – and that means leaving with a smile on your face. Nitrous oxide is also commonly known as laughing gas and in the operating room its sometimes simply called nitrous. This chemical compound, a gas, is an oxide of nitrogen with the formula N2O. At room temperature, this gas is colorless and non-flammable. When you smell it, the gas has a slight metallic scent and taste. At elevated temperatures, nitrous oxide is a powerful oxidizer similar to molecular oxygen. 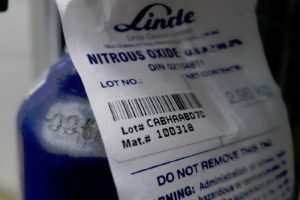 Nitrous oxide has significant medical uses, especially in surgery and dentistry, for its anaesthetic and pain reducing effects. Its name “laughing gas”, coined by Humphry Davy, is due to the euphoric effects upon inhaling the substance. The gaseous compound is listed on the World Health Organization’s List of Essential Medicines, the most effective and safe medicines needed in a health system.